The 2018 Ford Edge brings several different options to the SUV class of vehicles. The new Edge is an award-winning automobile that has been praised for its cargo space and seating areas. It was built to transport families and presents the best options in terms of safety. The new Ford Edge is designed to have a sleek and dynamic appeal. The the vehicle has a commanding look on the roadways with its futuristic shape. The SEL Sport is an athletic version of the car that offers dark headlamps and a unique front grill. It features mirror caps, a rear spoiler, side plates along with 19-inch wheels. 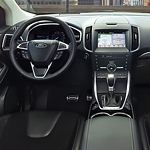 The inside of the Ford Edge contains trimmed bucket seats featuring a leather-wrapped steering wheel. The SUV has wheel choices that range from 18 to 21 inches. Car shoppers in Indianapolis should come in to Capitol City Ford and test drive the new Ford Edge today.